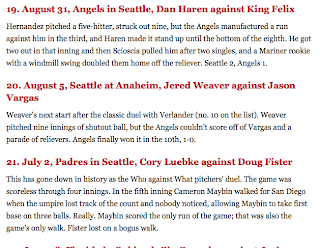 Mariner fans enjoyed 3 of the top 21 pitching duels in 2011, according to Bill James. 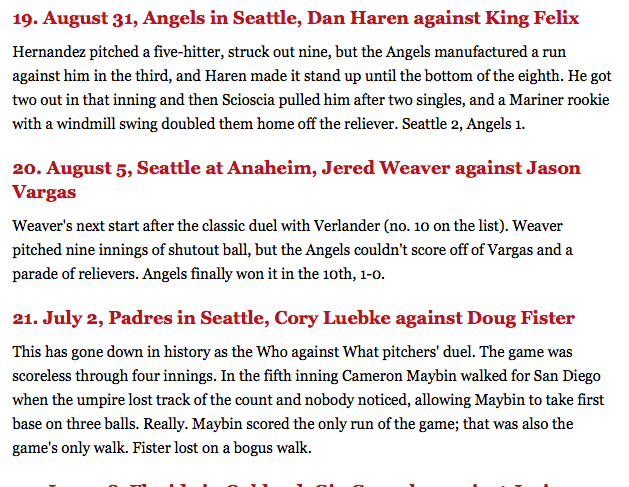 James just published his list of the 100 best pitchers duels of 2011 on ESPN's Grantland site. Hernandez pitched a five-hitter, struck out nine, but the Angels manufactured a run against him in the third, and Haren made it stand up until the bottom of the eighth. He got two out in that inning and then Scioscia pulled him after two singles, and a Mariner rookie with a windmill swing doubled them home off the reliever. Seattle 2, Angels 1. 2011 performances by Jason Vargas, Doug Fister and Michael Pineda also made the list. Pineda mania was short lived in Seattle. The Mariners have agreed to send right-hander Michael Pineda to New York in exchange for top prospect Jesus Montero, CBSSports.com's Jon Heyman reports. The Mariners will also get right-hander Hector Noesi, while right-hander Jose Campos goes the Yankees, Heyman reports. Mariner fans have been screaming for a big bat all offseason. Is Montero the answer? Montero has some success in a handful of big league games last year, hitting .326 with an OPS of .996 in just 18 games. In 109 minor league games in 2011 (AAA) he hit 18 HR with an OPS of .815.